"Nothing is wasted in nature." Even pseudogenes can regain their lost function and contribute to the cellular physiology. While the spontaneity and randomness of mutation renders every gene susceptible to sequence alterations, selection pressure keeps a check on the translatability of these changes. The haploid nature of bacterial genomes and shorter generation time increases the expressivity of genetic changes (1). This creates an unprecedented heterogeneity in a bacterial population (2). Environmental conditions often confer relative superiority to a genotype establishing its dominance in an environment. Some mutations affect the transcriptional ability of a gene and may render the gene product non-functional. These genes are categorized as pseudogenes (3). Despite possible resource wastage, such pseudogenes are present in the genomes ranging from bacteria to human. This raises a fundamental question about their presence. Gene essentiality is often conditional, and therefore the lethality of a gene loss is environment-dependent (4). Here, we present the first reported observation of a pseudogene repair, which restores the function of an inactive iron import system in Escherichia coli. Iron metabolism is critical for bacterial physiology and pathogenicity. Ironically, the availability of this crucial element is severely limited due to the poor solubility of ferric ion (5). Bacterial genomes, therefore, have a robust iron uptake machinery consisting of both siderophore-dependent and elemental import systems (6). Interestingly, laboratory acclimatization has compromised iron acquisition pathways in bacteria. For instance, the domesticated strains of Bacillus subtilis that are derived from B. subtilis 168 have a defective siderophore biosynthetic pathway (7). Similarly, several E. coli strains have lost functionality of the aerobic elemental iron transporter due to a point mutation in the efeU gene (8). This could be due to the relative ease of availability and lesser competition for iron acquisition in controlled environment. This provided us an interesting avenue to explore the possibility of the reversion of a pseudogene to its functional state. We designed a selection pressure for the conditional essentiality of the aerobic elemental iron import system constituted by EfeUOB. E. coli K12 MG1655 has non-functional EfeUOB due to the pseudogenic mutation in efeU but the iron import is unaffected because of the functional siderophore mediated system. We generated a strain that was deficient in the production of the siderophore enterobactin. This strain failed to grow in minimal media without exogenous siderophore supplementation. After evolving this strain using an adaptive laboratory evolution platform, we observed several evolved strains that were able to grow robustly without siderophore supplementation. The genome sequence analysis of all these evolved strains revealed frame restoring mutations in the efeU gene. This pseudogene repair had significant physiological impact and the strains could grow without siderophore mediated iron import. Interestingly, we observed a potential case of pseudogene repair from the natural environment as well. 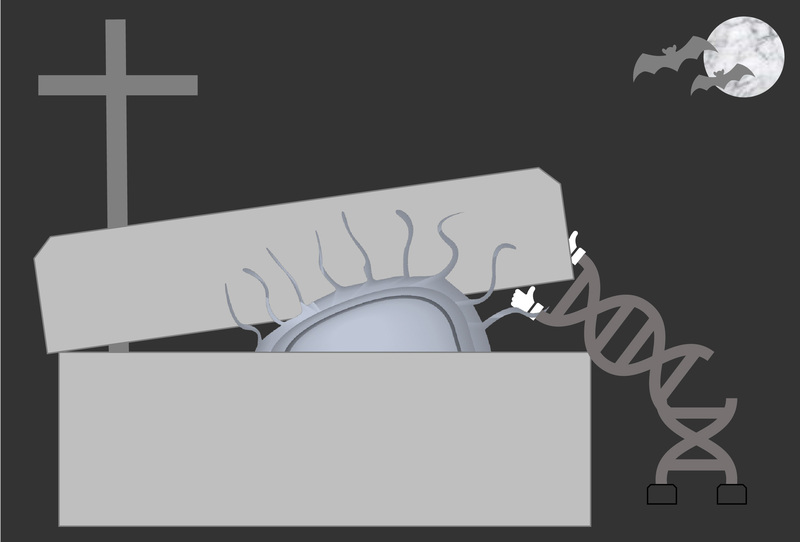 The consensus about pseudogenes is that they are functionless and often referred to as ‘junk,’ ‘genomic fossils,’ or ‘zombies.’ Previously it has been noted that several premature termination codons can undergo translational readthrough resulting in ‘pseudo-pseudogenes’ (9). Our report demonstrates that cell can eliminate the premature termination codon to repair its pseudogene for survival under selection pressure. This finding thus necessitates a shift in thinking to now include the pseudogenes along with the functional genes when estimating the metabolic capability of any organism. 1. S. Watford, S. J. Warrington, (Jan, 2018). 2. K. M. Davis, R. R. Isberg, Bioessays 38, 782 (Aug, 2016). 3. Y. Tutar, Comp Funct Genomics 2012, 424526 (2012). 4. G. Rancati, J. Moffat, A. Typas, N. Pavelka, Nat Rev Genet 19, 34 (Jan, 2018). 5. C. Ratledge, L. G. Dover, Annu Rev Microbiol 54, 881 (2000). 6. S. C. Andrews, A. K. Robinson, F. Rodriguez-Quinones, FEMS Microbiol Rev 27, 215 (Jun, 2003). 7. H. Pi, J. D. Helmann, Proc Natl Acad Sci U S A 114, 12785 (Nov 28, 2017). 8. C. Grosse et al., Mol Microbiol 62, 120 (Oct, 2006). 9. L. L. Prieto-Godino et al., Nature 539, 93 (Nov 3, 2016). A bacterial change of scene: a story about membrane filtration.